Doug Raney is the son of the famed jazz guitarist Jimmy Raney. His first interest in the guitar began at the age of fourteen, not with jazz, but with rock guitarists Jeff Beck, Jimi Hendrix and Eric Clapton. He eventually began to listen to some of his fathers recordings and then took informal lessons with Barry Galbraith. Raney attributes his development into a serious jazz performer after he had the opportunity to sit in with pianist Al Haig at Gregory's club in New York. In 1977 Raney joined his father for a series of club and concert dates in New York. They went on to play in some of the major cities of Europe. 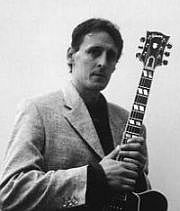 It was soon obvious that Doug Raney was a great jazz guitar talent in his own right. Since the early 1980s he has performed with Dexter Gordon, Johnny Griffin, Louis Stewart, Kenny Drew, Clifford Jordan and others. He also toured Japan with Duke Jordan. Over the past 20 years Raney has made many recordings as leader of his own groups and also as a sideman for the SteepleChase, Jardis and Criss Cross record companies.